My third visit to the beautiful city of Montreal was the first one that came with pleasant weather, quite welcomed for such a walking city. We were in town for the SIMA Symposium, where we exhibited at the Trade Show and participated in a few other events. Each evening we were able to enjoy Old Montreal and Crescent Street, while Thursday afforded us a bit more free time late in the day. After checking out the historic campus at McGill University and the nearby McCord Museum, I got ready to hop on a shuttle bus to Percival Molson Memorial Stadium as the CFL scheduling powers were on my side with the Alouettes playing their home opener at night. The bus had some issues both to (it was late) and fro (it didn’t make two scheduled stops), but otherwise this was a fantastic experience at a historic stadium that aesthetically became one of my favorites. Molson Stadium sits on the eastern slope of Mount Royal, thus setting up a spectacular setting. 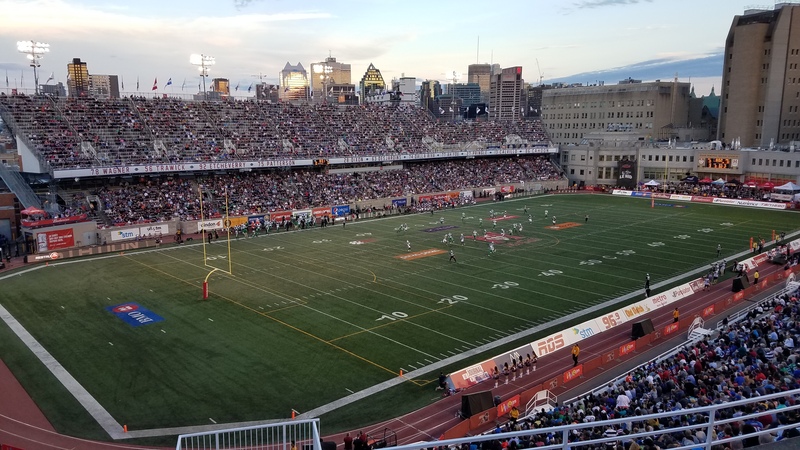 From one sideline, fans have a backdrop that includes downtown Montreal and the “Plateau” neighborhood. From the other side, the mountain looms over the stadium, along with the historic campus buildings. A steep set of sideline seats provides terrific sightlines and the end zones have their own unique seating, especially on the south end where it is occupied by the Neurological Hospital. In front is a row of beer tents that make for a good spot to socialize and watch the game. Renovations added historical displays to the western end of the building and there is indeed plenty of history here…over 100 years worth! Frequent readers of this site know how much I love old stadiums and the incorporation of old and new in combination with the beautiful setting make Molson Stadium a must visit. The crowd was lively and it was festive atmosphere throughout as there was a lot of singing and dancing with the music on the PA. The wave made an appearance as well. I am new to the CFL and for those not familiar, the primary differences from the American game are: Three Downs (instead of 4), goal posts at the front of a larger endzone, 1 point if a kicked ball is not returned from the endzone and orange penalty flags. I had a hard time getting used to the 3 downs and it really slowed the game down. It took awhile for a score as it was not until late in the 2nd when Montreal got on the board thanks to a 65 yard pass from Darian Durant, the former QB of their opponent Saskatchewan. The game got good at the end and the Al’s took the lead with an 18-yard field goal with just under 3 minutes remaining. The Riders drove back down and did what drives me nuts in all levels of football…settle for a mid-long range field goal. They easily could have ran 2-3 more plays, but instead, let the clock run down to attempt a 45 yard field goal. I was glad to see them punished as it missed and Montreal was victorious, ending a great stadium visit. Look for a detailed stadium review next week.